It's a rare sunny winter afternoon at the Hendricks Center for the Arts in downtown Beloit. 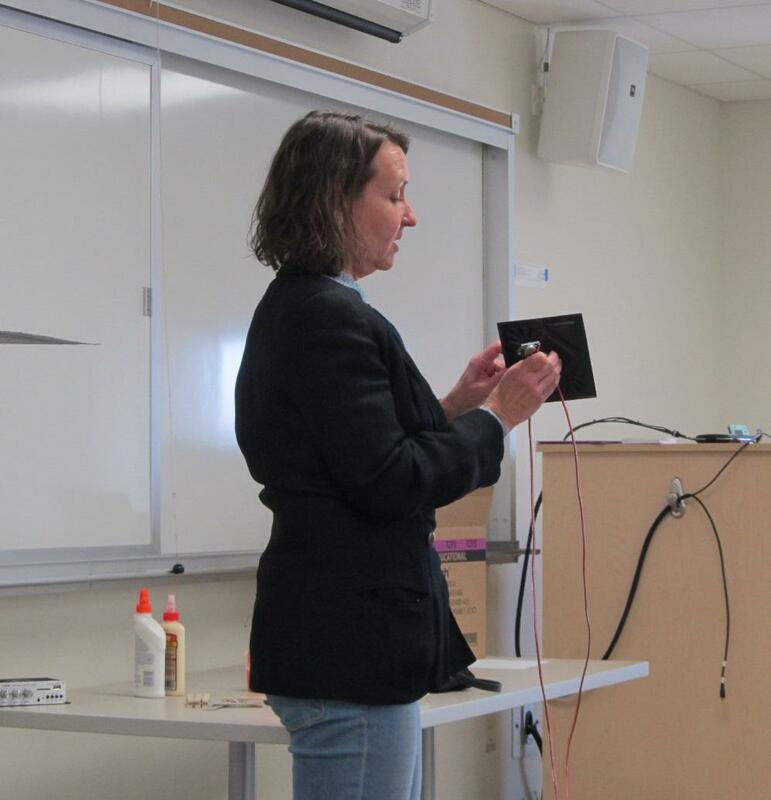 Sound artist Suzanne Thorpe demonstrates to students how small squares of plastic, wood or metal affect audio from a pair of transducers hooked up to her computer. The students will use the squares, found at craft and hardware stores, to create makeshift speakers. Those will be hung on mobiles also created by the students. 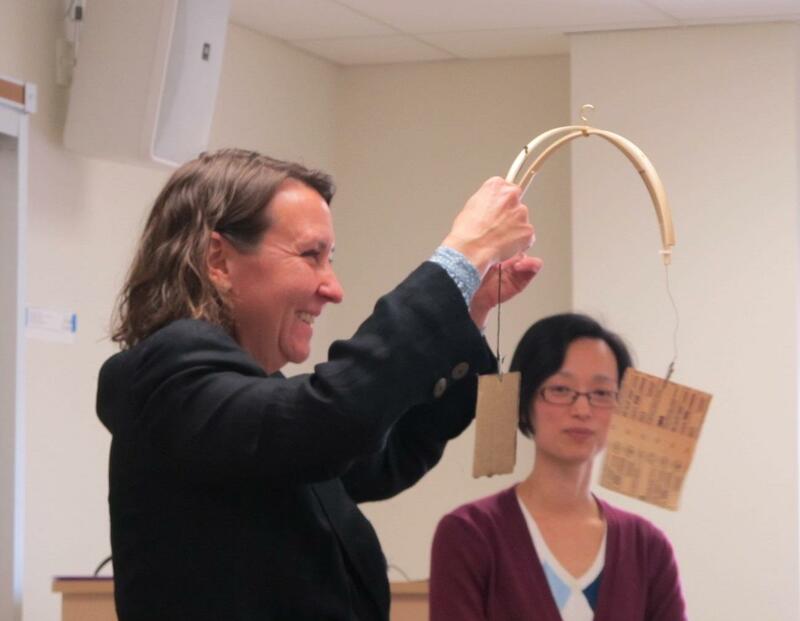 Music professor Yvonne Wu prepared the class for Thorpe's residency. She said the students had to learn how to do field recordings, then go out of the classroom to gather the audio they needed. "So some students decided to take recordings from their own dorm rooms," Wu said. "One student has collected sounds from the costume shop where he works. Another student works in the commons kitchen, the dining hall and wanted to record cleanup sounds because she found that to be very rich." Wu says they then worked with editing software to create a composition out of the everyday sounds they collected. Back in the class, the students break into groups to experiment with the materials. Bella Pixler calls her piece "Bella Dreams of Driving West." "All of it is from sounds from my car that I kind of like mess around with," she said. "So I was hoping to get the feeling of like when you fall asleep while someone's driving. And you can kind of still hear the car noises but it's really far away." Pixler said she'd done soundscapes for dance performances, but not one where her work will be front-and-center. Galen Alaks is a music major. He said he's taken music classes before but never experienced anything like this. "When I've done composing it's been a lot more based on chords and melodies. And so using different sounds to create these chords and melodies has been a lot different than just composing them with specific notes." Not to mention learning to record those sounds and to craft a mobile. Wu said once the speakers and mobiles are put together, they will be hung at the museum space for the performance. People will be able to move about and listen to each, as well as see -- and hear -- the way they interact. "So there will be this fun kind of scavenger hunt," she said, "of 'What sounds did you hear' and 'Oh, that became a really cool texture' or, 'There was kind of a harmony happening between the radiator and these chimes.'" At that point, Thorpe will come in with her flute and electronic musician Stephan Moore. The two will improvise, reacting to the sonic environment the students have created. Thorpe said creating that "sound ecology," as she calls it, has been a driving focus of her work. "It enables me to be musically in dialogue with different places," she said, "and to incorporate the sounds of place in a musical experience. And that's something that is very appealing to me." Thorpe has done works indoors and out. Some installations were pre-recorded. Others, like at Beloit, were presented live with a mix of natural or created sounds, acoustic or electronic performers, in various combinations. But Thorpe said the aim is the same: Everyone is invited to take in the ecology, pay attention to its details, and interact with it. "It opens up audience's expectations," she said, "and definitions of what is music and what is sound. And they start to recognize that the soundscape or the sonic world of their environment is a very active place that has a lot of information, and that they have a relationship of their own with." No one knows exactly what all this will end up sounding like at Wright Museum. Anyway, Wu said, what you hear will depend on your vantage point. Thorpe added if a person walks away from the experience with a mind – and ears – open to the sounds in their lives, the concert will have been a success.